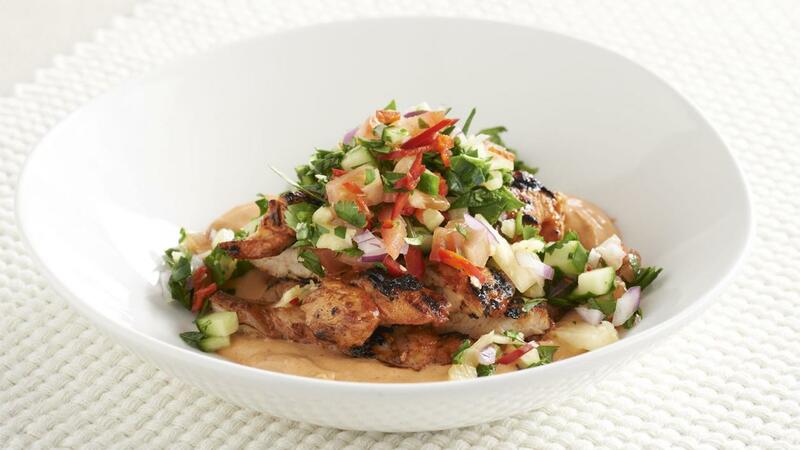 The yogurt with the butter chicken sauce give the dish a tangy, smoky flavour. Marinate the chicken in the KNORR Patak's Butter Chicken Paste, soy sauce and oil. Char-grill the marinated chicken until and slice. Roughly chop the spinach, coriander and mint then toss together in a large bowl. Add the cucumber, chilli, pineapple, tomato, red onion and lime juice. Mix the KNORR Patak's Butter Chicken Sauce with the yogurt and spread over the base of the plate. Place chicken on the red yogurt and top with the chop chop salad to serve.